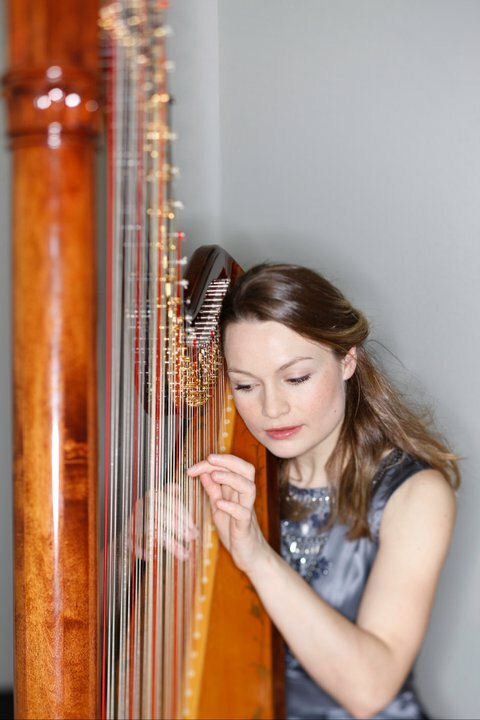 Harpist Eleanor Turner – one-fourth of quartet 4Girls4Harps – is the genius brainchild behind Cosy Concerts, a series of live concerts put on just for babies! We had a quick chat with her to find out more. 2MF: What inspired you to set Cosy Concerts up? ET: I heard about a similar scheme that is well established in London, called Bach to Baby, and thought “I should do that in Stamford!” My ten-year-old son has grown up listening to me practising for hours every day and going to many concerts. My toddler also enjoys all the live music in our house! I believe every child should be exposed to live music from an early age, connecting the musical sounds with the instrument and player creating them – it’s also a very special feeling to share the experience with friends and family. 2MF: What do they entail? ET: Each concert is 30 minutes of music and often the children start off quiet, rapt with attention, for a few minutes and then gradually their attentions wander and they start to play with toys and eat snacks. Just sitting still for more than a few minutes is not merely a challenge for an active baby/toddler – it’s an impossibility! So chaos reigns supreme ten minutes into a Cosy Concert! Doors open 15 minutes before the music starts so the children can get comfortable on cushions and bean bags, then we have a really varied concert of classical music, often including jazz, world and folk music, showering the children in the greatest possible array of sounds; trying to surprise and interest them as much as possible. Whenever there is a stark change of volume, pulse or timbre, there is a noticeable hush as the kids instinctively tune in, despite the rather noisy environment! 2MF: What was the first concert like? ET: The first concert was really exciting although extremely hard work to publicise from scratch. I got a real boost from a few of the parents who told me I was doing a great thing and that their child had been so much calmer and more attentive than ever before and expressing what a privilege they found it was to experience quality music and creativity with their children being a welcome, celebrated part of that experience! 2MF: Who do you have doing the performances? ET: So far I have been playing in all but one of the concerts! I have performed solo and with various other musicians. To put it bluntly, the advantage of me playing is that it doesn’t matter if I don’t get paid as it’s my own venture, so I can accompany another musician, who may well have travelled a fair distance to be there, without taking a fee myself. In a few weeks we’re having a Dixieland Jazz Quartet called ‘Happy Jazz’, which was a special request from one of the parents and I’m so lucky that they agreed to bless us with their jolly presence. I think there will be bubbles involved in their performance, too! 2MF: What benefits does live classical music have for babies? ET: It’s still early for me to tell you from personal experience what difference classical music causes in a baby’s brain, although I know there are many studies into this showing numerous positive effects, but I know that children learn through example, osmosis and being free to express themselves in a creative environment. It’s a privilege to be able to provide that, as a rare event, for a few others than just my own kids! I also love witnessing how the bonds between carer and child are strengthened as the live music is experienced. 2MF: How do the little ones react? ET: The children all react differently to the music but there are definite united moments where the whole audience goes quiet for a moment as a new piece begins or there is a sudden change in mood or tone colour. I love those moments – especially as most of the time the kids either walk around, colour pictures or play with toys (or fight over them!) and can be pretty noisy, yet they’re listening as well. They haven’t learnt to listen quietly but it’s amazing to see the changes – I get told the changes by the parents, with some saying that their child NEVER stops racing round when at home or out, but that the live classical music created stillness and a different, more receptive, mood. 2MF: What about the parents? ET: I’m very grateful that the carers share what their favourites were with me, or what they think were their child/children’s favourites. Often it’s pieces that have special effects in them (for example a Japanese piece that I play where I have to scrape nails on strings, use a tool to create a Japanese harp sound – a bit like a Clanger talking – and do many unusual sounding pedal slides. Sorry, technical talk!) or pieces that they can tell I am loving performing, and rhythmic music (including jazz) always goes down well. 2MF: What have you got coming up in the future? ET: Future plans for the concerts include creating fun but healthy snack packs (my husband does the catering) as the children love to have a nibble during the concert! I bring toys but I’d also love to have a collection of age-appropriate discovery bags so that the children are encouraged to sit still by having a variety of textures and little toys to explore as they listen to the music! I am going to hand out a survey at next week’s concert and I’ll be very excited to get my first bit of concrete feedback. I’ll be having a break from the Cosy Concerts over the summer but would like to start again in September and make them bigger and better with many more artists on our books!